Kenya’s Central Plateau (or Central Highlands) stretches from the Matthews Range in the north down to Nairobi in the south, and borders the Rift Valley to the west. The area has a number of towns and villages, none of which is particularly worth a visit. However, the region's national parks and game reserves are a completely different story: the central plateau is home to areas with wildlife concentrations second only to the Masai Mara, and wilderness as remote as anywhere in Africa. The Laikipia Plateau – Where is Kenya’s Central Plateau? The Laikipia plateau, as it is now known, stretches north from the Abadare Mountain Range to the start of the Samburu tribal lands, and lies in the shadow of Mt Kenya to the East and the Matthews Range to the North. The fertile southern and central parts of the plateau attracted many white settlers in the early part of the 20th century that the region became known locally as the White Highlands. This area now contains some of the country's best game viewing areas in converted white settler ranches and farms creating one the best conservation success stories in Africa, including the world famous Lewa Downs Conservancy which offers a game density second only to the Masai Mara. The Samburu National Park, to the North East of Laikipia, also has impressive game densities, but similar to the Masai Mara, attracts a higher density of tourists. Just to the east of Mount Kenya in the south of the central plateau lies Meru National Park, a lovely little park that attracts few package tours and therefore remains fairly untouched. 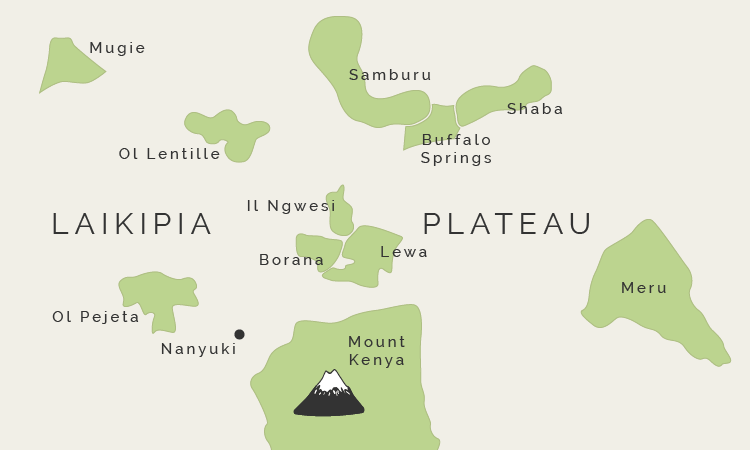 In the far north of the central plateau lies the Matthews Mountain Range, which forms the boundary to Kenya’s northern wastelands. The Matthews Range is a stunning area as remote as can be found in Kenya, with only a couple of lodges, and which attracts walkers and travellers seeking isolation and fascinating cultural interactions with the Samburu Tribe.